28/04 - Chicks on Spee..
03/05 - Agent Side Gri..
11/05 - Nils Landgren ..
25/05 - Malmö Rock Fe..
05/06 - Sweden Rock Fe..
07/06 - Zobens un Leme..
21/06 - Hellfest Open ..
Wow! The keepers of the grail of the NWOBHM strike back! German band ROXXCALIBUR surprised me, not totally since I´ve heard most of them in another band, but still enough in 2009. Their debut, “NWOBHM for Muthas” sruk me like lightning, carrying the legacy of bands like CLOVEN HOOF, DARK STAR and JJ´S POWERHOUSE like their lives depended on it. After a lot of festivals spots, not least with quite a few NWOBHM luminaries; have contributed to spreading the word. Today, I guess they are back by demand, at last! The intro “London Bridge Is Falling Down” is a childrens´ rhyme, but, alas, so arch-British. It sets the stage for faithful interpretations of MORE, CRYER, OXYM and SPARTA. Never heard of? Well, time to change that! For those less initiated there are the likes of SATAN, TOKYO BLADE and THE TYGERS OFD PAN TANG. If you thought they´d settle for a mere SAXON standard you got another thing coming. “Lift Up Your Eyes” was an unfinished track until Biff and Paul Quinn gave ROXXCALIBUR permission to finish the unfinished business for them. Everything is delivered with a lot of heart. Alexx Stahl may not be Brian Ross, Jon Deverill or even Steve Bridges, but he sure sing with conviction. Luckily he´s no Luther Beltz either... The odd choice of OXYM`s “Music Power” is not up to par, and too lengthy, and the VENOM standard “At War with Satan (Preview)” is not exactly an exciting choice. But no doubt they´ll get Cronos up on stage for a rendition of it at some German retro festival or other. If I had my way the band to reform for gigging purposes this time would be CRYER. 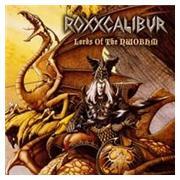 Last time around ROXXCALIBUR unearthed JAMESON RAID, an excellent choice too. Filled with hope for the future, hoping for at least three more installments in this series (two of them no doubt called “Newest Electrical Warriors” and “Scenes of the Crimes”, complete with a Kawasaki and a Bobby)I am euphoric. I sincerely hope that new generations of rockers will discovered these old gems, be influenced and let their music do the talking. Just like hundreds of Englishmen did some 30 years back in time. If you don´t buy this one Basil Fawlty ought to give you a good spanking shouting “You´re a naughty boy (… fill in the blanks)!